LANSING — When Tom Byers first laid eyes on a birch bark canoe, it wasn’t what he saw that captivated him most. It was what he heard. Byers, a descendant of the Canadian aboriginal group Métis, is part of a movement to revive a craft once key to traveling the Great Lakes region. The birch bark canoe was once a valuable means of transporting Native American goods, people and ideas, said John Low, who grew up in Southwest Michigan as a member of the Pokagon Band of Potawatomi. He’s now an Ohio State University assistant professor of comparative and American Indian studies. Europeans adapted and used it during the fur trade. The art of constructing birch bark canoes would be lost if not for the work of a few dedicated people, Low said. Low remembers when elders in his community attempted to build a canoe, hoping others would follow in their footsteps. Another person working to keep the art alive is Ron Paquin, a self-taught artist and elder of the Sault Ste. Marie Tribe of Chippewa Indians in Sault Ste. Marie. 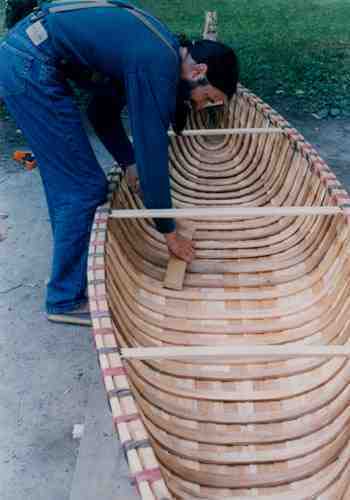 Paquin’s mastery of birch bark canoe-making earned him a 2003 Michigan Heritage Award from the Michigan State University Museum’s Michigan Traditional Arts Program. He was also awarded an Art Serve Michigan grant and a Native Arts and Cultures Foundation Artist Fellowship to teach the technique to tribal adults and youth. The booklet and accompanying video outline the birch bark canoe-building process step-by-step, providing pictures from a workshop with the Little River Band of Odawa Indians in Manistee. First, large, thick sheets of white birch bark are unwrapped from tree trunks in the summer. Paquin uses plywood sheets, rocks and stakes to shape the bark into the curved canoe bottom. The bark is laced to the upper wood frame using spruce or jack pine roots. After the roots are dug from the ground, they are boiled, peeled and split to create strong, pliable ropes. Rot-resistant white cedar is split to form the bottom planks and curved ribs of the canoe, which give the vessel its shape and stability. Minor tears and seams between bark pieces are sealed with a mixture of pine sap and animal fat to make the vessel waterproof. Although Paquin follows traditional building methods, he improves efficiency with modern tools such as an electric drill and commercial caulking. He also purchases some of his lumber from mills. 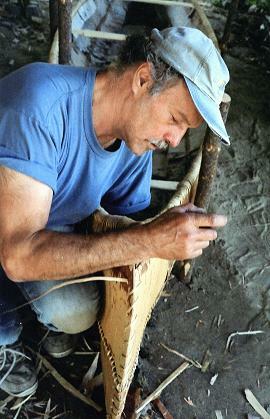 Other self-taught artisans learn birch bark canoe-building techniques from a variety of sources. “Each canoe has a different style, a different set of challenges, and the goal is to acquire the skills to meet those new challenges and try to see if you can make that certain canoe just the way it appears in the book,” Mase said. Depending on the materials used, a 14-foot canoe can take between 30 and 50 hours to complete, Mase said. This time commitment requires dedication. Each artist has his or her own motivations for pursuing the art form in addition to income from sales. Mase enjoys the creative process. For Byers, the vessels are an example of what humans can accomplish when they work with nature rather than against it. They’re made from renewable resources, don’t create pollution when made or used and are completely biodegradable, he said. A number of individuals have joined Byers at his workshop to construct their own canoes. They include historical re-enactors, those hoping to become professional canoe builders and others who enjoy the canoe’s romanticism, Byers said. “There are probably about as many reasons as there are people,” he said. Whatever their motivations, artisans across the Great Lakes are sustaining a work of art that is of cultural and historical significance to many in the area. Holly Drankhan writes for Great Lakes Echo. LANSING – Not many of the Earth’s creatures can say that they’ve survived being chewed up and pooped out – but the ostracods of the Great Lakes can. Ostracods – also known as seed shrimp – can survive getting eaten by the round goby, an invasive fish that comes from central Eurasia, according to a recent study.